Regardless the final scores of all NBA games played during Hoops for St. Jude Week March 7-13, the winners will be the kids at St. Jude Children's Research Hospital. Every matchup will help the hospital raise awareness and increase support to fight childhood cancer and other deadly diseases. The NBA Family will shine a light on the work and successes of St. Jude through online, social media and in-game promotions such as hosting and highlighting local patients in-arena. NBA coaches will also wear St. Jude lapel pins during games. St. Jude ambassadors – players and coaches who contribute to and regularly visit and encourage others to support the patients, their families and others at St. Jude – will also use their social media channels, personal appearances and interviews to help raise awareness of St. Jude and its mission to save the lives of children battling cancer and other deadly diseases. New ambassadors for this year’s Hoops for St. Jude campaign are players Greg Monroe (Detroit Pistons), Mike Conley (Memphis Grizzlies), Mario Chalmers (Miami Heat), and coaches Monty Williams (New Orleans Pelicans), Rick Carlisle (Dallas Mavericks) and Mike Brown (Cleveland Cavaliers). “The investments our Hoops for St. Jude ambassadors are making by visiting our patients and maximizing opportunities to share the mission of St. Jude have been instrumental in helping us to advance our work of saving the lives of children,” said Richard Shadyac Jr., CEO of ALSAC/St. Jude Children’s Research Hospital. "We are fortunate to have the support of the NBA and various coaches and players, including Pau Gasol, Marc Gasol and Kevin Love, and David Lee, who wholeheartedly embrace our mission." NBA support stretches beyond Hoops for St. Jude Week. Just this season, the hospital has hosted on-site visits by players, coaches and staff from the Dallas Mavericks, Sacramento Kings, Toronto Raptors, Phoenix Suns, Detroit Pistons, Houston Rockets, Utah Jazz, New Orleans Pelicans, Oklahoma City Thunder, Memphis Grizzlies, Los Angeles Lakers and others. The players’ support – both financial and celebrity – helps in other ways, too. It costs $1.9 million a day to operate the hospital, and 75 percent of funds come from public donations, so every dollar donated through Hoops for St. Jude and other campaigns goes to help ensure that no family receives a bill from St. Jude. Visits are very personal for players, too. In a recent visit, Pau Gasol met with patient Jorge and his father, who is from the same area in Spain as Pau. “I signed a basketball for him, and played some games, and it was great. But to learn about him and his family, and to be able to talk about it in our native language, well, that was really special,” said Gasol. In an earlier visit, he had the chance to play a game of one on one with patient Isaac. Another patient, Laci, captivated the Houston Rockets with her Rainbow Loom skills during a recent visit. 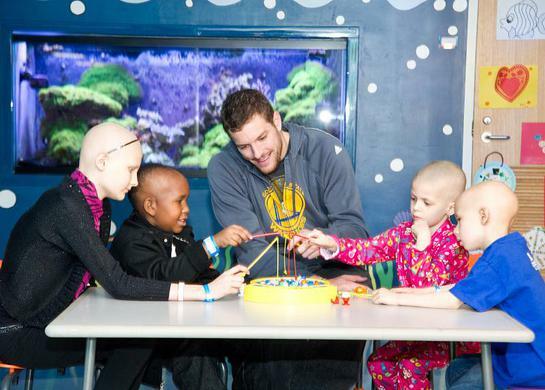 By the time the team left, each player had received a handmade Rainbow Loom bracelet – all in fewer than 10 minutes. Fans can get involved with Hoops for St. Jude Week and help support the lifesaving work by following @StJude on Twitter, using the Hoops for St. Jude hashtag (#hoops4stjude), and visiting stjude.org/hoops to lend support or become a Partner in Hope.